Planning to visit Udaipur? Although there are many famous palaces and places of tourist interest within and around the city which will amaze you, but the Monsoon Palace is the one that can leave you spellbound. Situated at the distance of only 5 kilometers west of Udaipur, there is the grand and palatial hilltop palace, namely Monsoon Palace, also known as the Sajjan Garh Palace or the Sajjangarh Fort. The Monsoon Palace in Udaipur is built with beautiful white marbles. It is located on Bansdara peak of the Aravalli Mountains range, overlooking the wonderful view of Udaipur’s several lakes, palaces, and surrounding countryside below the palace. The plan for the construction of the Monsoon Palace was made by Maharana Sajjan Singh. He planned to construct a nine storey complex, basically an astronomical center in order to keep track of the movement of the monsoon clouds in the surrounding area of the palace. By doing this he was also plan for providing employment to people. He had also plan to provide a resort for the royal family this palace. Unfortunately, he died prematurely at the age of 26 only and hence did not completed the palace. Before his death, he had built it partially. The entire palace complex was completed by his successor king Maharana Fateh Singh. Maharana Fateh Singh cancelled the plans of Maharana Sajjan Singh and turn the palace into a monsoon palace, resort of royal family and hunting lodge. The grand historical Monsoon Palace is architecturally beautiful and never fail to lure its visitors. Built in the white marbles, the palace features high turrets and guards regulating each of the towers. Supported by exquisitely carved pillars with beautiful motifs of leaves and flowers, the palace also features a striking central court with a stylish staircase and several beautiful rooms and quarters. Plastered with lime mortar, the walls of the palace are extremely beautiful. The night view of the palace is simple awe-inspiring. The illuminated Monsoon Palace with the Rajasthani architecture comprising of beautiful domes, fabulous fountains and arresting Jharokhas at the night will give a fairytale unforgettable experience. Not only this, you will also have a wonderful opportunity to explore Sajjangarh Wildlife Sanctuary that encircles the historical Monsoon Palace. You can see several wild animals here enjoying the superb beauty of nature as well. It is a very popular for bird watching as here can be seen several species of birds. 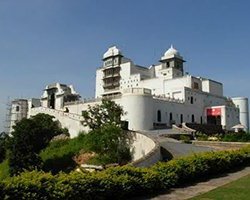 In few words, visiting the Monsoon Palace in Udaipur would be a great experience for you. Reaching the Monsoon Palace is easy. You can take an auto-rickshaw or a taxi from the main Udaipur city to reach this grand and historical Monsoon Palace.